Any Size Window Cordless Blinds only $128, Measured & Installed! Safety isn't usually the first thing you think of when it comes to window treatments, but the industry has worked hard to ensure that its products are safe for you & your family. These cordless blinds will keep your mind at ease and your rooms looking stylish, whether you have little ones in your home or not! That's right! We'll measure & install these beautiful Cordless 2″ custom faux wood blinds on any size window in your home for only $128 per window! These popular and dependable blinds are available in nine (9) colors to match any decor and any room in your home. We're excited that one of our customers sent us some drone footage of their home in Bay Head, NJ that shows how great the window treatments look from the outside, and also a wonderful example of the evening privacy ability of these shades. Stay tuned for more, as we'll post the full video soon, along with a description of what each of the treatments are and their benefits to any home! Cordless, light-filtering cellular shades in a Springfield, NJ home. In this week's before & after photos, we look at the simple elegance of cordless light-filtering cellular shades (also known as honeycomb shades) as a great look in this home. These shades are also available with a room-darkening feature for those who would like to filter out even more light. ASAP Blinds in Manasquan NJ has you covered for all of your window fashion needs in Monmouth & Ocean Counties and throughout New Jersey. Call us today at 732-223-6662 to see the other home window blinds and shade options we offer! New patterned fabric valances and cellular shades in a Spring Lake, NJ home. In these before & after photos, we show how simply updating a fabric valance and adding new cellular shades can make a world of difference. Of particular note is the verticle option on the sliding glass door in the kitchen. People often ask what kind of window treatment is best for a sliding glass door, and while that can always vary from home to home, the VertiGlide cellular option shown here is a very nice choice! For this home on the Jersey Shore, we sold and installed woven wood Roman shades with turned headrails to provide an exotic yet stylish look in the rooms . Woven Romans bring a unique personality to any room, and the turned headrails keep the shades closer to the window for a cleaner look. Be sure to check out the close-up shots of the textures of these shades...the uniqueness of the weave gives them a fantastic look! Before & after of woven Romans, with detail. Before & after of woven Romans in dining room, with detail. See your home (or office) in a new light! Skylights. They look great in nearly any environment. But things can get awfully hot beneath them from all that sunlight. That was the case in an office building in Manasquan, making conditions uncomfortable for employees. This skylight was up two floors, beaming down onto the foyer and the receptionist. We outfitted it with a Motorized Skylift Cellular Shade to make it easy to open and close, and also to take advantage of cellular shades' great light control and insulation capabilities, making for happier employees and great savings on utility bills! ASAP Blinds in Manasquan NJ has you covered for all of your window covering needs in Monmouth & Ocean Counties and throughout New Jersey. Call us today at 732-223-6662 to find out about our other options for skylights and any other window you have, no matter how unique! These woven Roman shades combine the great looks of woven wood shades with the elegance of Roman shades for a combination that looks great at this Jersey Shore beach home! Not only are they create a striking impression in rooms with a large amount of windows, but they also look great on French doors! This time we're having a look at a bay window on which we installed white plantation shutters. Shutters can be a good choice in bay windows, especially one of this size. And, as great as they look inside the room, they also look really great from outside the house! Automated window shades for the home are becoming increasingly popular. With the advent of "smart home" technology, it's no surprise that power window treatments would be one of the most in-demand items for making homes more efficient and luxurious. Among our favorites for custom automation are Silhouette shades from Hunter Douglas. Silhouette shades are a soft window treatment, meaning basically that its main component is fabric. Silhouettes feature vanes made from soft fabric that seem to be floating within the shade, and that can be adjusted to control how much light to let in, similarly to slats on window blinds or louvers on shutters. As with other modern window shades, the Silhouettes can also be raised or lowered, allowing a full view out the window. Close view of automated Silhouette shades before & after installation, with vanes open & closed. Motorized window shades are controlled using a remote device (or an app on your smart phone or tablet) that lets you lower and raise them automatically, as well as control the tilting of the vanes. It's a great convenience being able to adjust your room for privacy or light control with the tap of a button - and quite a sight to behold as the shades seem to magically adjust to your preferences! 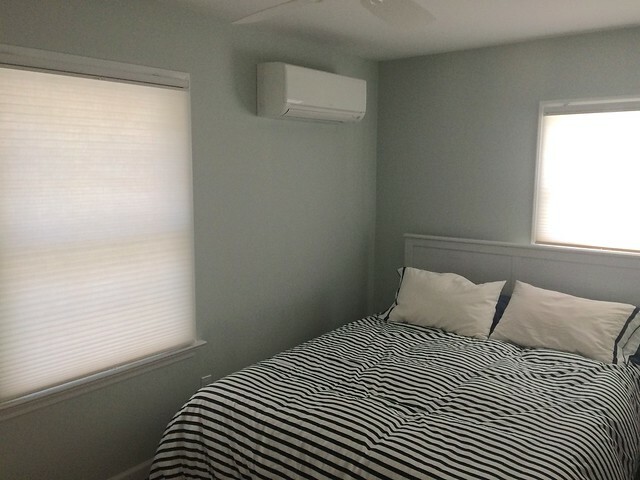 It's also very easy to set the shades to automatically raise and lower at certain times of the day, freeing you from having to make those adjustments yourself. Generally called "scenes," you could for instance set your shades to remain lowered but have the vanes open at 7am, then have the whole shade rise at 9am, and then close automatically at sunset. And anything in between. The options are nearly limitless! Below is a video playlist of a few projects featuring remote-controlled Silhouette shades with PowerView from Hunter Douglas. Watch them in action! Update 6/6/17 - Here's a new video of Motorized Silhouette Shades in a Beach House Bedroom. 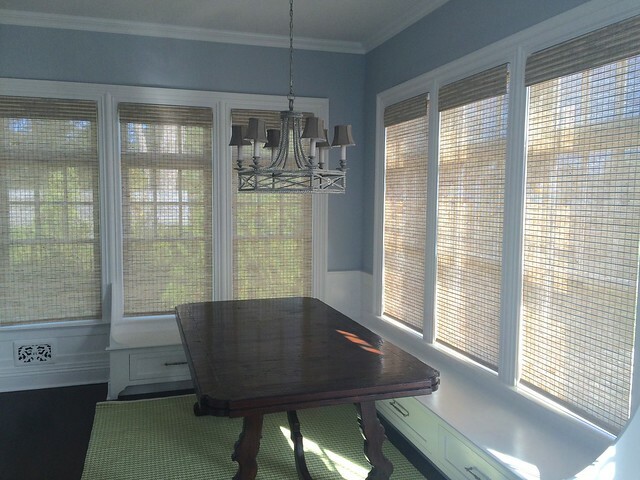 Motorized Silhouette shades with drapery in a dining room. This week we're taking a look at some before & after shots of white plantation shutters with hidden tilt bars in a couple of bedrooms and a home office. What a stylish look for any room in the home! This week we're looking at cellular (honeycomb) shades in a dining room and a living room, which give a clean and stylish look to the rooms. Notice too the sliding glass door early on in the video, and how the shades work so nicely with it! Check out this video of before & after photos where we supplied and installed beautiful Hartmann & Forbes Roman Shades. The shades have a rear valance, which is hidden from the front, allowing a smooth and clean look! Check out this slideshow of us installing white plantation shutters with front tilt bars in this Jersey Shore home! Check out this slideshow of before & after photos from a recent job where we installed white wood blinds, white wood plantation shutters, and white café shutters to enhance the style of this lovely home! Check out these before and after photos as we add white wood plantation shutters to this home, and don't miss the arching radial specialty shape in there! Here is a slideshow of photos from a job we were pleased to work on in a house on the water. We installed custom cordless top-down, bottom-up cellular (honeycomb) shades in several rooms, including a vertical option on the sliding glass door you'll see in the video. These cellular shades come in a variety of colors and light-filtering options, and pair well with other window treatments such as drapery. To see individual before & after photos, check out our Facebook Photo Album for this project! For only $99 per window we’ll professionally measure and install beautiful cordless, light-filtering cellular shades on any sized window in your home (residential only, minimum 5 windows, price does not include tax). It's a great No Hidden Fees kind of sale like our Any Size Window Blinds deal, and one you should really take advantage of! These cellular shades - also known as honeycomb shades - feature cordless operation, which is ideal for homes with small children and pets as it's much safer than window treatments with cords, and their light-filtering capabilities are great for privacy and light control, as well as energy efficiency! They're also available in seven different colors to match your home's decor. But don't dally! Give us a call at (732) 223-6662 and ask for Jay at extension 107, or drop by our showroom at 2408 Highway 34 in Manasquan to find out more! Here is a slideshow and a few before & after photos of a job we were pleased to work on with some white plantation shutters in a couple of bedrooms by the sea. Take a good look at how the shutters work nicely on the doors, particularly the French doors, and also the custom arch shapes! Here's a slideshow of photos from a recent project we were pleased to work on. Before & After shots of motorized Nantucket shades in a high ceilinged foyer and bedroom, and motorized woven wood shades in a dining room and a room overlooking a deck. See these shades in action! Motorized designer roller shades are a great choice for any room in your home. In addition to the convenience of raising or lowering them all at once, you can also use the scheduling feature to have them rise or lower at specific times of the day, even times as elusive as sunrise or sunset depending on your system! Don't think that "all the way up" or "all the way down" are your only options, either: you can easily control - even schedule - at what position you want them at any given time! And because they're cordless, they're a safer option for homes with children or pets. ASAP Blinds is the Jersey Shore's leader in motorized window treatments and custom motorization designs for your home. We're experts in remote controlled motorization, using systems such as Hunter Douglas PowerView and Somfy technologies, so talk to us about your window treatment motorization needs...you'll be glad you did! 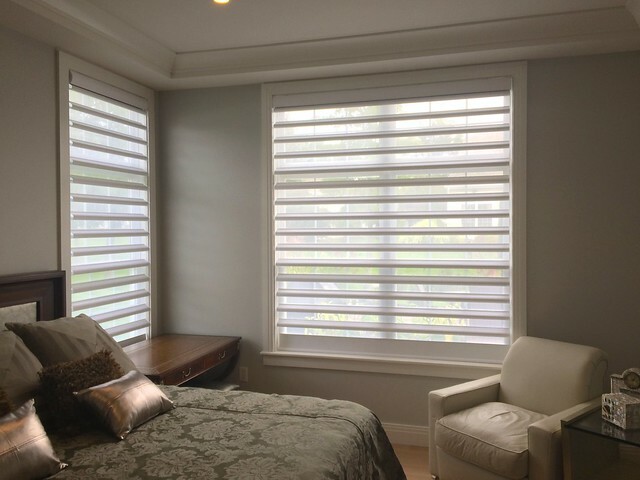 ASAP Blinds is pleased to be providing luxury, handwoven natural window coverings by Hartmann&Forbes in Monmouth County, Ocean County, and all along the Jersey Shore. Hartmann&Forbes infuses natural and organic materials and objects into modern interior spaces with a spirited passion for progressive design, renewable materials, handcrafted quality, and sustainability. The quality and uniqueness of their window coverings makes them a great match for ASAP Blinds as we seek to provide our clients with options that are pleasing to the eye, functional, and forward-looking. If you're like us, your kitchen is one of your favorite - and most frequented - rooms in your house. Choosing the right window coverings for your kitchen windows can be a hard decision, but luckily there are lots of options to satisfy a wide variety of moods and tastes. One very popular choice for kitchen window treatments is motorized shades, such as the ones shown in the video below. Motorized window shades can be controlled by a handheld device, an app for a smartphone, or a control panel on the wall. They can be set to automatically raise and lower at specific times of the day, so you can have them open every morning before you get up, greeting you with a great look at the day from the very start. They're also great for hard-to-reach windows, which can happen a lot in kitchens around the table. As with any window treatments, privacy is always a consideration. Motorization allows you to have multiple shades open or close simultaneously, making an easy way to get private all at once without forgetting a window or having to make the rounds from shade to shade. You can also control how much light to let in or keep out with the push of a button, which can be great for light control as well as privacy. Keeping in line with the overall style and decor of your home or room is a vital consideration. Luckily, all types of window treatments can benefit from motorization (blinds, shades, curtains, etc. ), and there are so many great design options within each type of window treatment. The elegance and simplicity of motorized coverings adds that extra "Wow!" factor to whatever you choose. ASAP Blinds is the Jersey Shore's leader in motorized window treatments and custom motorization designs for your home. We are experts in remote controlled motorization, using systems such as Hunter Douglas Platinum Power technologies and Somfy RTS remotes, and have designed and installed them throughout Monmouth County, Ocean County, and along the Jersey Shore. Call us today (732-223-6662) and let us show you how easy it is to add the luxurious experience of motorization to your life, and be sure to check out more of our motorized window treatments on YouTube. Should I Put Motorized Window Shades in My Dining Room? It's a fair question: should you put motorized window treatments (shades, blinds, curtains, etc.) in your dining room? While everyone's tastes and budgets will be different, we'd like to offer a resounding "Yes!" as the answer to that question. Not only can they bring an extra touch of style to an already elegant area, but they can also add personality to smaller, more intimate dining spaces. But there's more than just their visual appeal: convenience is a big factor in people choosing motorization, and not because they're lazy. Windows in hard-to-reach spots such as corners and heights can have their shades easily raised or lowered without the risk of injury or furnishings damage from standing on chairs or reaching over things. Safety is another benefit, especially if you live in a home with children or pets. Motorized window shades and blinds are cordless, thus eliminating any of the threats posed to the little ones in your home. Motorized window treatments are also energy-smart! They can easily be programmed to automatically rise and lower at specific times of the day, allowing you to keep your dining room from getting too hot or cold (depending on the season), thus keeping your bills and energy consumption down even when you're not around. As a bonus, this can protect any fabrics, photos, and art you may have from sun damage as well. Now that motorized shades are becoming more affordable, they are definitely worth considering for your dining room, or any room in your home for that matter! Plantation Shutters by ASAP Blinds! We hope you enjoy this video featuring some of the plantation shutters we've installed over the past few years! Many people have asked what the difference is between regular shutters and plantation shutters. Generally, most of the shutters you see these days are of the plantation-style, which have wider louvers than traditional shutters, which are usually only about 1 1/4 inch. These wider louvers afford a better view when open, and better protection from the heat of the sun when closed. This style of shutter was popularized in the Old South, where the sun could be brutal. In the video, you'll see examples of plantation shutters with front-tilt bars and hidden tilt bars (also known as Invisitilt), as well as examples of shutters used to great effect on sliding-glass and French doors. As the temps start dropping we at ASAP like to remind our clients window treatments are a very important part of conserving heat. Without energy-efficient window coverings, as much as 50% of a home's heating and cooling can be lost though the windows. In the wintery months your home heating escapes through the windows. With window treatments that provide insulation you can reduce energy costs while maintaining warmth. The best product to achieve this is a cellular shade. The term cell describes the pocket on the honeycomb shade. Because inert air is a poor conductor of heat, a honeycomb shade creates an effective temperature transfer barrier between the window and the room.